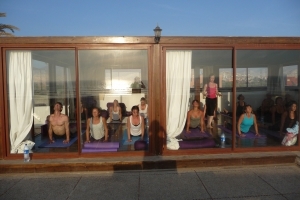 During our yoga teacher training in Morocco, we make Villa Mandalla on the southern coastline your home and sanctuary. Sitting on the coastline of the tiny Banana Village near Taghazout, a small fishing area and famed surf spot, escape the hustle and bustle of the normal tourist traps. This rustic, beautifully maintained villa offers the perfect amount peace and privacy needed for an intensive training. Wake up and practice with sunrise views over the Atlas Mountains and wind down with stunning sunsets, dipping below the waves. We take our yoga classes and training on the roof of the villa, in a dark wooden yoga shala which is gently warmed by the sun, making it the perfect place to be on the mat. Enjoy sumptuous, healthy, fresh vegetarian meals to replenish your energy levels and cleanse your body. On your days off there are plenty of adventurous activities to take part in, from surfing to horse-riding. To soak in the local culture journey to Agadir souk to barter for bargains and exotic wares. For those more inclined to soaking up some sunshine and chilling out, the Villa pool or a trip to Paradise Valley beckons. Embrace the fairytale magic of Morocco and let your practice and relationship with yoga be transported. Transfers to and from the villa are included on the Morocco yoga teacher training course. "Embrace the fairytale magic of Morocco and let your practice and relationship with yoga be transported"